gmail calendar is a free Google calendar client app for Windows 8 and 8.1 computer that helps in syncing your Google calendar and bringing all the details of your calendar right on your desktop. gmail calendar will ask you to add a gmail account to the app, you can do so by clicking on the top right side of the app. You will be asked to login to your gmail account and allow permission to access the public profile and add the details from your gmail account to the gmail calendar app. The gmail calendar app displays the calendar featuring the events, appointments and other important dates you have marked in your Google calendar in the app. The whole data syncs to this google calendar client and presents you the updated feed of your gmail calendar. You can add new tasks or events to the calendar by clicking on the date. A menu on the left side will open to add details about the task or the event. After adding the details to the event, you can click on the save button and the tick mark on the event. The existing events can be easily edited in the Google calendar client app itself. The app is simple and hardly has many colors in it. It displays the events in different colors; the color of the text is black, the background of the calendar is white and the header is light grey. The user-interface is clean and minimal. The menu can be toggled by right clicking anywhere on the app screen. 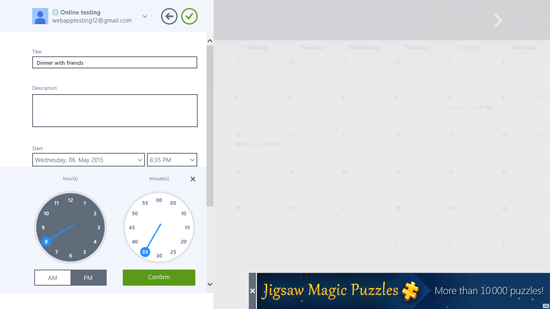 The calendar can be viewed in day view, week view and month view formats. This app is helpful for everyone who want to track their calendar details, modify or view it right from their desktop and not signing in again and again to their Gmail account.